There was a big surprise in Chicago in 2010 when the Council on Tall Buildings and Urban Habitat handed out awards for the year’s best skyscrapers. The world’s tallest, the Burj Khalifa, won in the category of Global Icon, but scooping the Best Overall award was Broadcasting Place in Leeds, designed by Feilden Clegg Bradley Studios (FCBStudios). It has a comparatively modest corten steel-clad tower, rising just 22 storeys and full of student flats. 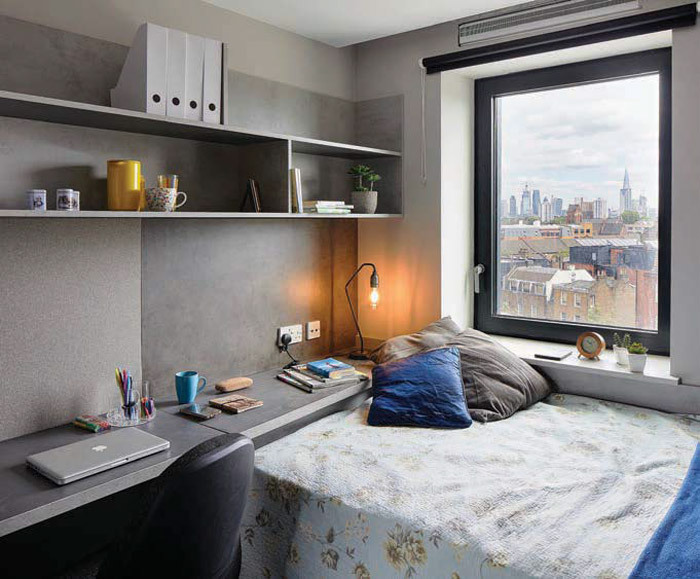 It was the start of a new typology that is now trending across the UK — the student residential tower — and, has since spread as far as New York and Melbourne. 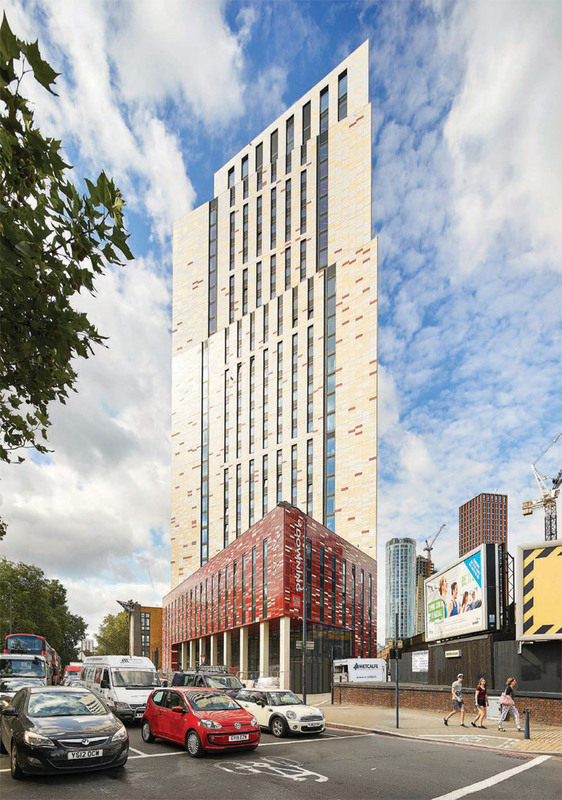 FCBStudios’ latest example is The Atlas in Vauxhall, London, and just like their pioneering Leeds tower, cladding and form are what make the 96.5m-high podium-andtower composition stand out. Before entering The Atlas, we could ask why is the skyscraper the new college dorm? Land is a tight resource, driving maximum return for a plot. Piling up students in multilevel bunk beds isn’t an option — today, they expect privacy and an en-suite bathroom. The answer, as with offices or flats, is building upwards. Why didn’t anyone think of high-rise college dorms before? First, the UK’s student population has exploded since the Sixties’ wave of new universities (usually built in the brutalist style). In 1971, there were 640,000 students in the UK according to the Office for National Statistics; in 2016, there were 1.84 million. And in the Sixties, cities were decentralising and expansive new campuses were built away from their centres. Today, the urban context of colleges in cities like London or Manchester is densification. The Atlas, developed by Liverpool-based Downing, provides residences for students of King’s College London. The 1650 sq m site is triangular, with a brick rail embankment hosting garages and light industrial to the west, beyond which a veritable forest of towers is rising around the new US Embassy in Nine Elms (Blueprint 357). The short side of the triangle is to the south, where more skyscrapers are under construction — including another one for students, an Urbanest development designed by tp bennett. The South Lambeth Road bounds the site to the east, across which is Vauxhall Park and a 19th-century conservation area on the south side. The building responds to this split urban context in form and in its remarkable terracotta cladding, an idea that came from the area’s past as once home to the Royal Doulton ceramic factory. FCBStudios had used terracotta cladding at its Aston University Engineering Academy (2012) in Birmingham. The four-storey podium or plinth relates to the traditional scale of the area, and is clad in two shades of red with a 10% spread of light blue and buff-coloured panels. The high-gloss red is a nod to the traditional red brick of buildings across the road, and the glossy finish reminds you of Leslie Green’s red-tiled Edwardian Tube stations, although there are none in the immediate vicinity. But above the plinth, the cladding is quite different. The triangular tower is almost entirely clad in the two buff shades and the cool, almost-white, shade of blue, which becomes more dominant higher up. It’s not a case of making it fade into the air as a fully glazed tower may, but it does reflect the sky and mitigate the mass of the tower. When facing one of the facades straight on, the tower’s solidity, with windows in vertical strips and setbacks at levels 19 and 28, suggests a New York art-deco tower, in particular Raymond Hood’s wide, heroic RCA Building (1933). But The Atlas twists its triangular floorplan slightly with its setbacks, which recede from the park, and that emphasises its angular geometry. It also produces a sculptural effect of stacked blocks, just as Broadcasting Place did at one end of its tower. The setbacks allow two slivers of biodiversity-friendly green roof, on which hardy grasses are already established. The plinth shares its residential function with a fitness facility. 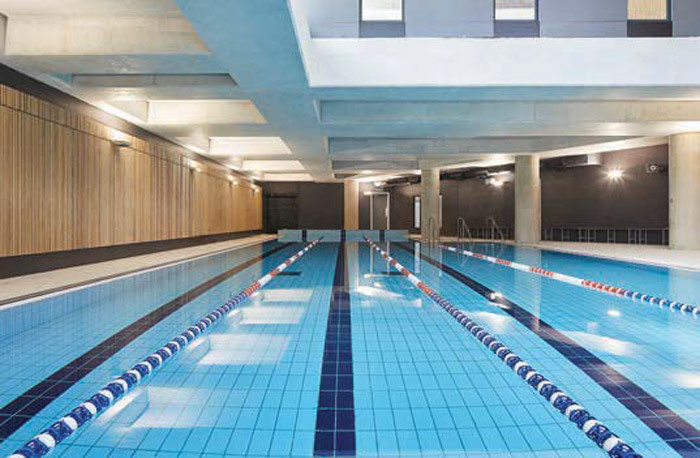 A 25m-long pool in the basement is visible from the street and served by a unisex ‘changing village’. That required the floors above it to be suspended, but the pool lies below the site’s sharp eastern end, not below the tower. FCBStudios partner Jason Cornish says: ‘It’s just like a Roman thing, a massive structure with a bath inside.’ Behind concrete columns, a two-storey glazed recess on the street frontage reveals the exercise machines on the first floor, above the gym’s entrance, which is separate from the adjacent student entrance. Students have to pay for the gym just like anyone else. The upper two floors of the plinth are where the student accommodation begins. There’s a total of 578 rooms, and they continue up into the tower all the way to level 30. Up to the 10th floor, 330 rooms from 12.5 sq m in size are arranged in clusters of four to eight, and share combined communal kitchen and social lounges. Every room has an en-suite bathroom, made by Offsite Solutions, delivered as prefabricated modules and slotted into the building’s concrete frame. From level 11 to the top are studio rooms, which also include kitchens. They range from 15 sq m to 25.5 sq m. The internal corridors around the triangular core, with their long rows of numbered doors, feel like a hotel, but here the occupants have checked in for a full academic year. While hotels and student accommodation seem to be converging, FCBStudios partner Alex Whitbread, who saw The Atlas through planning, also notes that ‘in a way’, student accommodation is ‘aping buy-to-let residential’. All the interior decor is by Liverpool-based KKA Interiors, and the rooms are fitted out in muted grey tones. KKA’s Liz Roby explains that the colour palettes explore ‘the industrial landscape, railway heritage, nature and many other aspects of the area’. In the shared cluster areas, the idea was ‘to have a look of an exclusive gentleman’s club with indirect references to London in the artwork and textures, such as subway tiling’. She adds that ‘we were inspired by the parks close by’, but in a jarring rebuke against nature, plastic plants have been deployed, apparently because Downing didn’t want real ones. That’s a shame in the otherwise cool, mildly eclectic approach with a hint of hipster, summed up by the words decorating an event space on level 4: ‘Good Vibes Only’. This level 4 common space opens on to one of two roof terraces, whose landscaping by Landscape Projects of Manchester is about the last work to complete before students arrive this month. The level 4 terrace is a triangle on the plinth’s northern end, overlooking South Lambeth Road and featuring hard and bouncy-asphalt surfacing, planters, stone walls, and almost a complete circle of larch bench. The level 31 terrace is very different, enclosed within a crown of high walls that extrude up from the tower, and clad white on the interior. Tall, laminated, double-glass windows not only provide stunning views, they also bring rectangles of sky into the outer envelope. The students in residence at The Atlas will see skyscrapers in almost all directions, but not one of London’s most distinctive yet — because they will be looking out from it.